Located on the second floor of the Garden House, this spacious lodging at our bed and breakfast near Madeline Island welcomes guests with a variety of amenities. The Brownstone Room’s comfortable appointments include a king bed with luxurious bedding, two large wonderful chairs, TV, fireplace, whirlpool tub, private bathroom with shower, and private deck. Soak in the views of the perennial gardens in one direction and Pikes Creek Valley in the other. 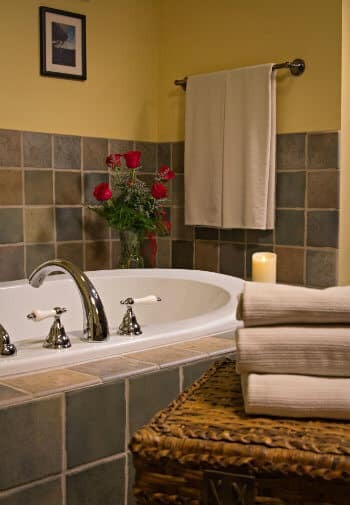 The Brownstone Room tends to be our most popular room, many attracted by the 3-sided fireplace that can be enjoyed from the spacious whirlpool tub for two. Step out onto the private deck to take in all that mother nature has to offer and take some time to relax and unwind. Maximum two people in this room. The rates include full breakfast along with all of the Pinehurst Inn Bed & Breakfast amenities. 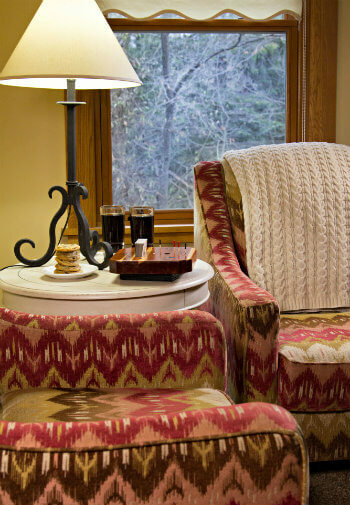 Be sure to check out current specials and more great reasons to visit Pinehurst Inn Bed & Breakfast and Bayfield, WI.